Jonathan Isaac and Troy Caupain put up 20 points apiece as the Magic earn an 86-80 win over the Nets in Summer League action. Shawn Dawson had 20 points off the bench for Brooklyn in the loss. CAREER TRANSACTIONS: Was not drafted by an NBA franchise...Signed as a free agent by Orlando (Aug. 31, 2017)…Waived by Orlando (Oct. 13, 2017)…Played with Lakeland of the NBA G League (2017-18)…Signed as a free agent by Orlando to a two-way contract (Jul. 11, 2018). 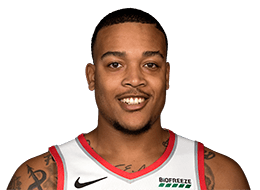 PROFESSIONAL CAREER: 2017-18: Played and started in all 50 games with the Lakeland Magic of the NBA G League, averaging 15.6 ppg., 7.5 rpg., a team-high 5.8 apg. and a team-high 1.44 stlpg. in 37.7 minpg., while shooting .841 (143-170) from the free throw line…Was the only player to appear in all 50 games with Lakeland…Also played in Italy with G.S.A. Udine of the Serie A2 Basket league after the NBA G League season concluded. Played in 137 career games (102 starts) during four years at the University of Cincinnati, averaging 9.6 ppg., 3.8 apg., 3.6 rpg. and 1.10 stlpg. in 29.8 minpg….Became the first player in school history to record at least 1,300 points and 500 assists during his career…Left school as the Bearcats’ all-time assists leader with 515…Also ranked on Cincinnati’s all-time list in career victories (second, 102), consecutive games played (second, 137), minutes played (third, 3,980) and games played (fourth, 137)…Named First Team All-American Athletic Conference in 2015-16 and Second Team All-American Athletic Conference in 2016-17. Born in New York, NY…Son of Renee and Troy Caupain Sr.…Finished as Cosby High School’s career leader in rebounds (347) and assists (230), while ranking second in points scored (1,449)…You can follow him on Twitter: @caupain10.